Everyone remembers their first time… Remember your first day at school? Remember your first day in your real job? Remember that first kiss? 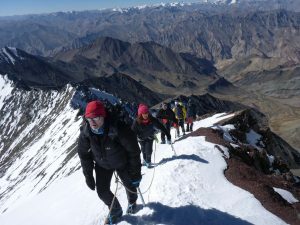 Tackling your first 6000-metre mountain is guaranteed to bring the same mixture of nerves and excitement. What will my team-mates be like? Am I up to the task? Having invested all this time and money will I enjoy it? Some 6000-metre mountains are tough. They present themselves like bullies rather than lovers and are hard to crack. 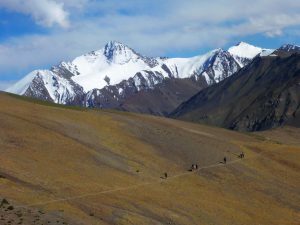 Not Stok Kangri. For my team seeing this incredible mountain for the first time it was love at first sight. Before them, rising head and shoulders above the pastel-tinted hills lay a mountain as only a landscape artist could paint it. Always dominating the skyline. Always there intriguing and challenging. What was there not to like about this experience? 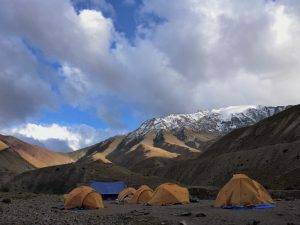 We started with a tour of Leh the tiny capital city of the mystical sounding Kashgar region. 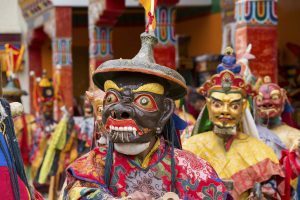 Above the colourful bustling streets where vendors tried every trick in the book to make a sale, stood several gracious and majestic monasteries we went on to explore with a young Buddhist monk. His enthusiasm for their incredible history, art and imagery were humbling and we each reflected on how peaceful this way of life could be. 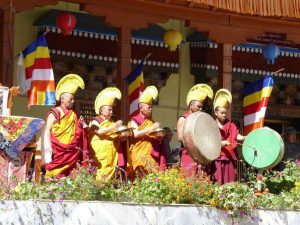 On our return, we reacquainted ourselves with his way of life and watched swirling mask dances, polo matches and archery staged by Buddhist monks both young and old. It was mesmerising and felt an honour to be able to see such traditions. 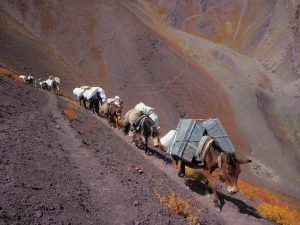 The trek that took us through a landscape conjured up by Salvador Dali was tough at times but never failed to entrance. 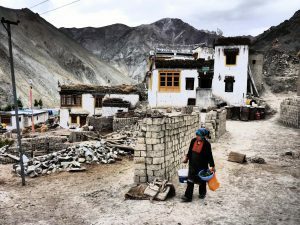 Every day we were woken by a rowdy cheer for tea by Tibetan men who belonged to the landscape as much as the golden eagles that graced the horizon. Our camping equipment was loaded onto the backs of sturdy horses, driven by gnarly horsemen whose rough features would regularly be broken by startling smiles. 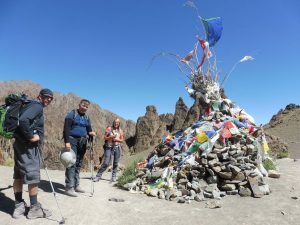 The path crossed two high passes, each decorated by many prayer flags to honour the spirits which dwelled there and offering views over mountains painted in a myriad of pastel colours. Walking across streams is always fun! 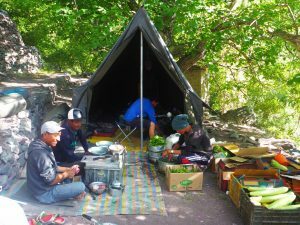 At night we camped in valleys, sometimes rich in walnut, fruit trees and weeping willows. Once near a local village we watched locals busily working their fields and heavily laden donkeys carry enormous loads of hay, making them look like gigantic yellow hedgehogs. Summit day was like stepping into an adventure book. 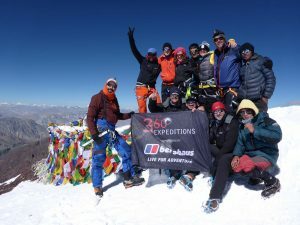 We dug deep, found ourselves exhausted, willed each other on, climbed ever-steepening snow-slopes, watched a lazy sun slowly begin to add warmth and light to the horizon and traversed a steep exposed ridge to finally arrive at a picture book summit. Prayer flags fluttered busily in the wind, as around us 3 countries and 2 of the world’s greatest mountain ranges collided in a vista which stunned us first into silence then ecstatic jubilation. What a powerful place to be. To experience the sensation of having realised such a unique achievement with such an incredible team of people. 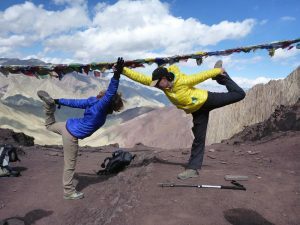 The generosity and playful humbleness of the Tibetan guides left us wondering how we had ever lost touch with the simple more important things in our busy western lives. The landscape added powerfully to these subtle lessons of how to enjoy the simple pleasures in life and how to feel even more content then when surrounded with the gadgetry of our modern lives. The simplicity of watching the sunset from an isolated hilltop, the beauty of watching working men carefully load their horses and meeting the stray dog which loyally followed us to the summit spoke volumes about not needing a TV set to be entertained by life. Fun times with team mates! 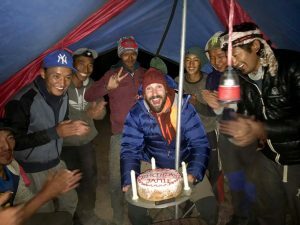 The team readily embraced the experience and laughed, played feisty games of cards and discovered a little-known part of the Himalayas together as if they’d known each other for years. Every day we woke up eager to explore more of this unique place we had found ourselves in. To say that we bonded as a team would be the understatement of the year. Two of our team decided to get engaged whilst descending the mountain. We entered civilisation not only having realised ambitions, having had a great time but deeply humbled by this unforgettable country and its people. 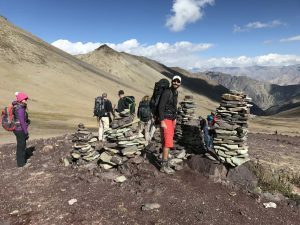 Climbing Stok Kangri sure is going to be a first time that will be remembered with a fond smile for a long time to come and if you want to JOIN ME and my team next September, you would be more than welcome and it will be guaranteed FUN! 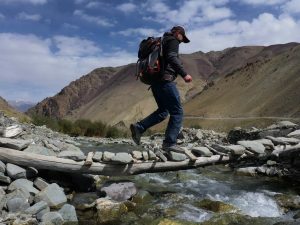 Or…if you prefer to be part of an all women’s Stok Kangri team we are proudly running a Love Her Wild expedition with Jo Bradshawat the helm. Just get in touch and book your place! This one is already half full.